Gearing up for Halloween is always fun. This year, it is even more fun because we are in our new home. 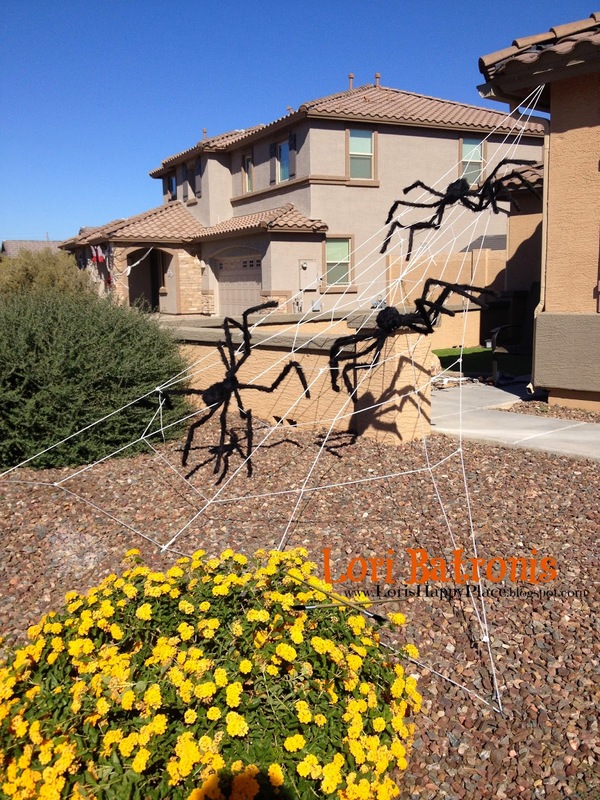 I decided I wanted to build a bunch of huge webs and spiders in the front yard. That is how my artist brain works, GRAND!! The Hubby is always the one to make me think more realistically. 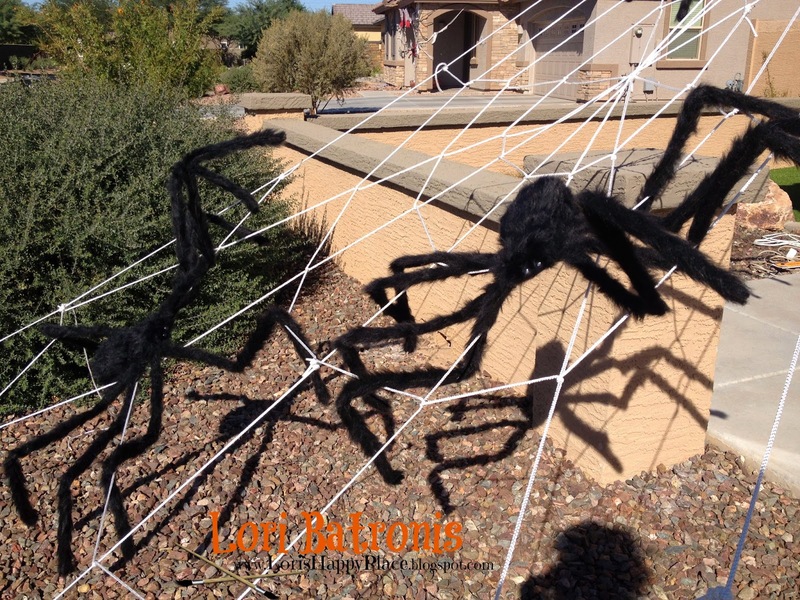 So, this year we decided on one huge web and some 5 foot play spiders from Walgreens. Hopefully each year, we can add more webs and someday a humongous spider. Ok, ok, ok, maybe the Software Engineer with a plan and the book are not necessary, but my VERY organized Hubby helped this artist from just going out in the front yard and managing to just tie herself up in rope. 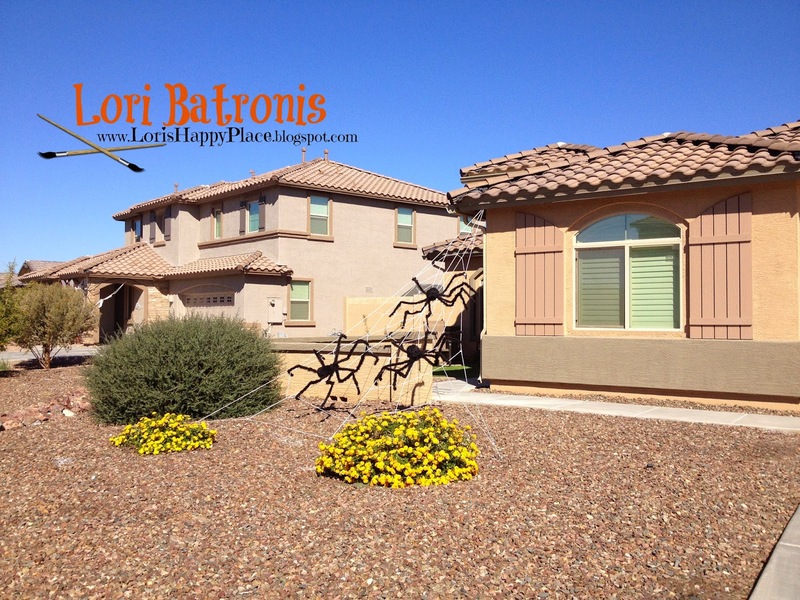 We decided on a triangle shape because we wanted to anchor the web to the house. You can follow these same basic instructions no matter what shape you want to do. 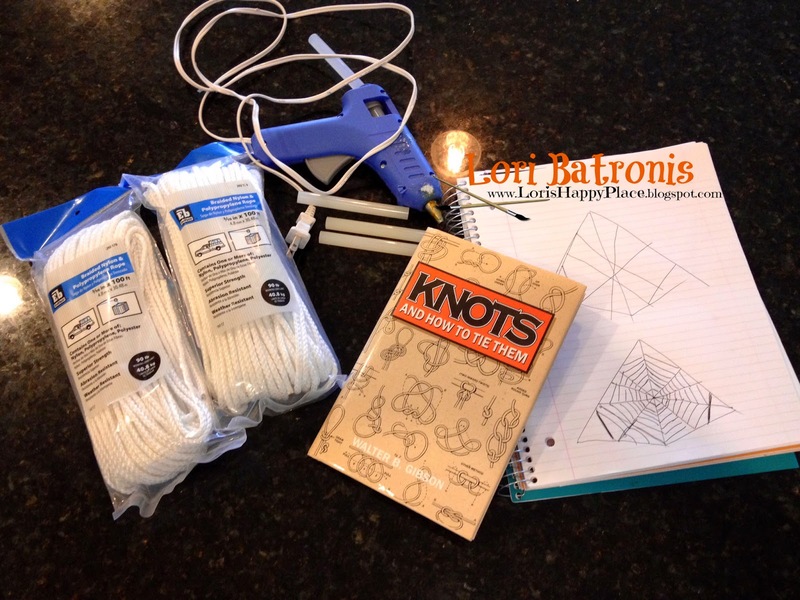 1) Make outside shape of web using one continuous piece of rope. Use tent stakes to stake to ground. 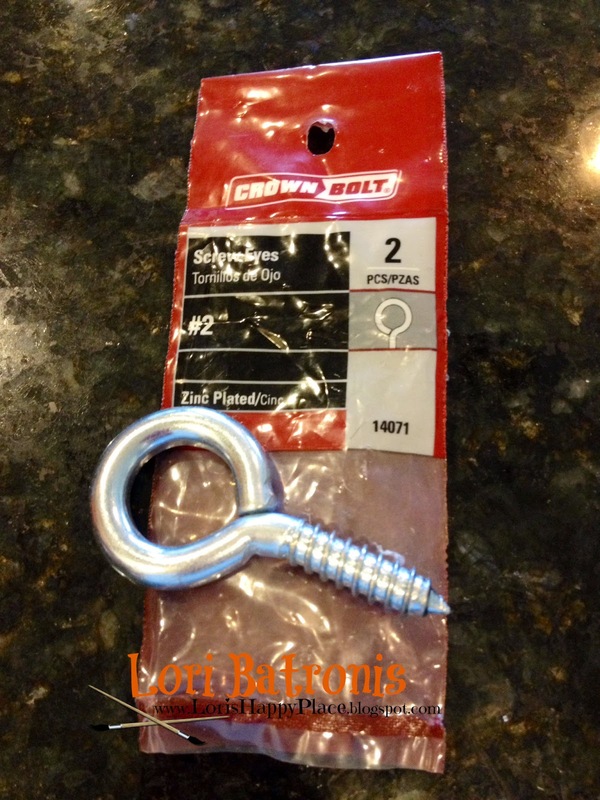 Use 2 S hooks to attach to Screw Eye on house. 3) Add individual diagonal ropes to finish out the web shape. 4) A dollop of hot glue can be added below any knots you think may slip. 5) Cut one piece of rope for each circle on your web. 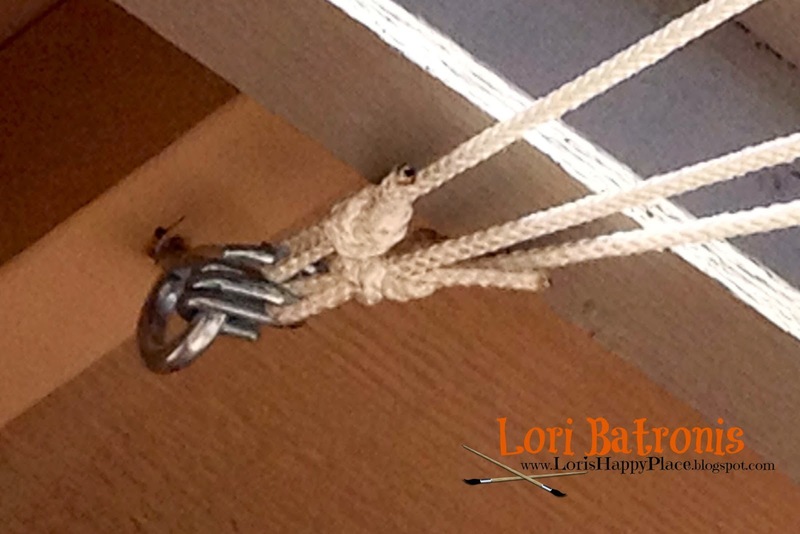 Use Fisherman's Knot at the beginning and end. Just loop the rope once around the diagonal supports. 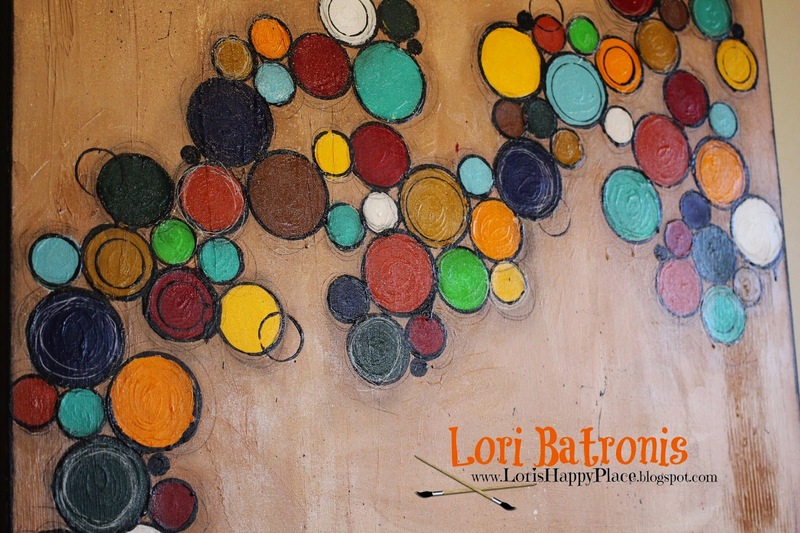 For each circle, vary where you start so all knots are not on one rope. 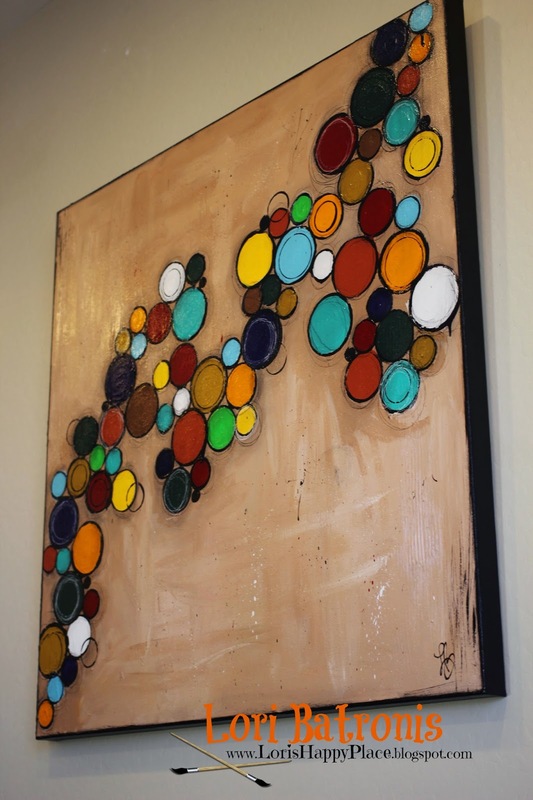 6) If you have extra room above and below your circles, you can add a few semi circles to finish out the web. 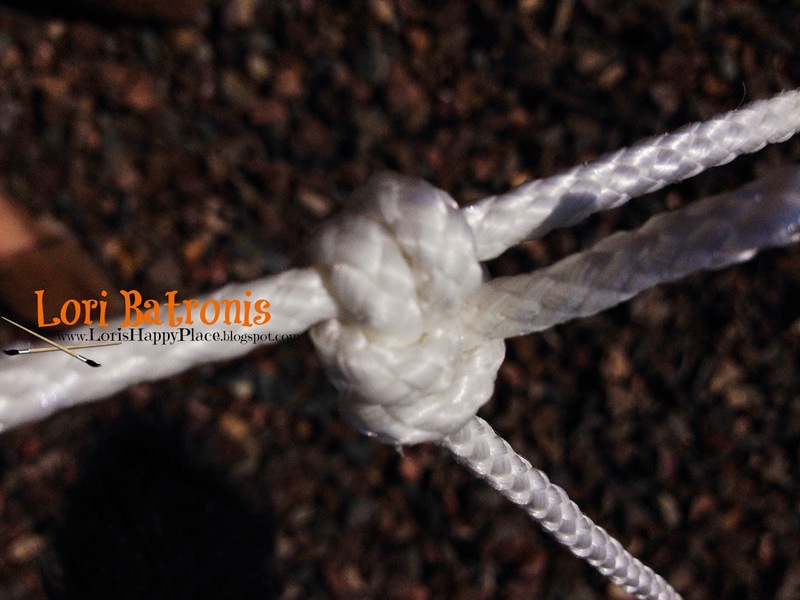 7) Add a dollop of hot glue to any spots where you think your rope may slip. Our web is 18 ft x 13 ft. This entire project took about 2 hours to complete. 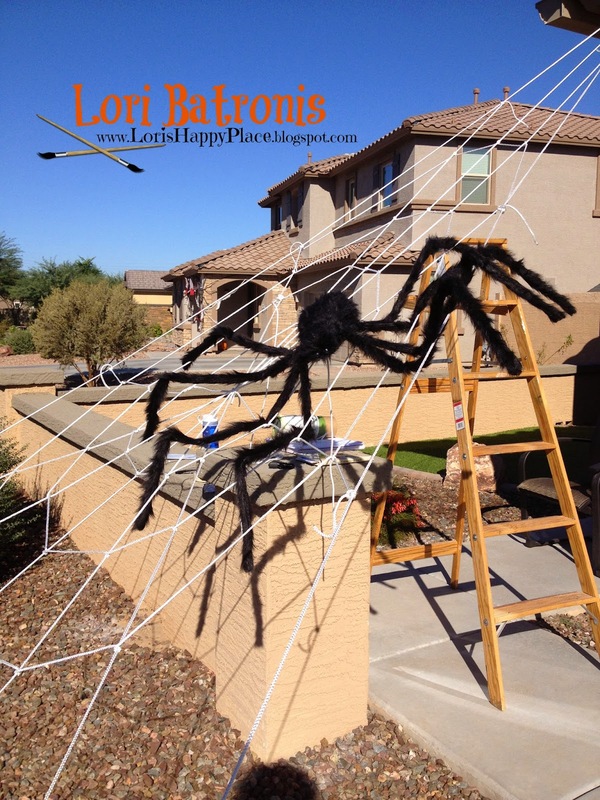 Halloween 2015 - 20 foot SPIDER??? PS - Thanks Honey, for all your work. It looks fabulous!!! Let's face it, life is hectic!! Most of our days, are spent doing something for someone else. I am not saying that is a bad thing. As a spouse, parent, friend, co-worker, business owner and many more, we all spend a majority of our lives giving. The problem comes when we have given all of ourselves. Yes, you are a spouse, parent, friend, etc., etc. But, first and foremost, you are you!! Don't ever lose track of your hearts desires in the busyness of life. There is a saying, "If mom's not happy, no one is happy". It is harsh, but true. In the last year, my family has made some major life changes. It is all good. We all are very happy where life has taken us, BUT!! But, in the process of keeping life happy, keeping the plates spinning, and keeping my family on the straight and narrow, I lost me. I took on the pressure, and in the process kind of forgot about what really made me happy. I lost my self confidence. I doubted that my art was any good. I worried more about what others thought, then what I thought. So, earlier this month, after taking the family on our first real getaway in a long time, I broke out my paints and painted for ME. This painting is just for me. It won't be for sale. It was me finding me, and it turned out perfect!! It is an amazing feeling to get to this place in my life. I painted what I liked, and I don't care if someone else likes it or not. This painting is my heart. 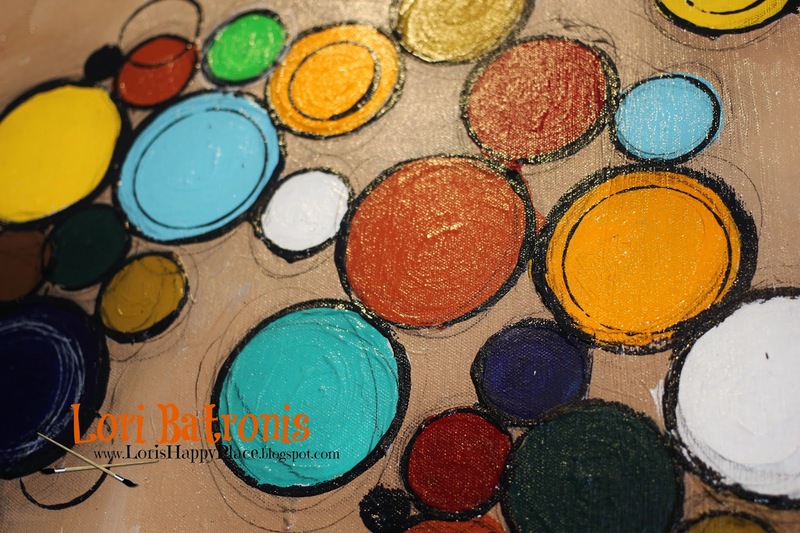 I call it "Circles of Life". 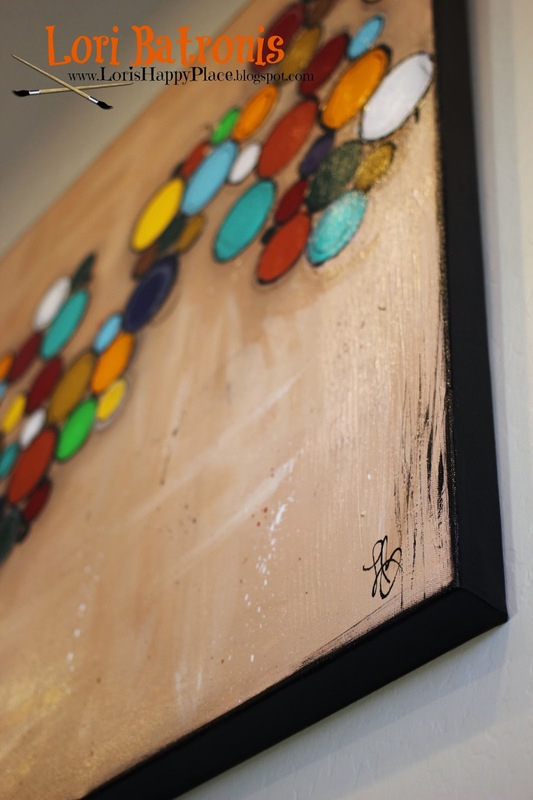 When I look at it, it shows me that life is a colorful mess, sometimes up, and sometimes down, but ALWAYS good. 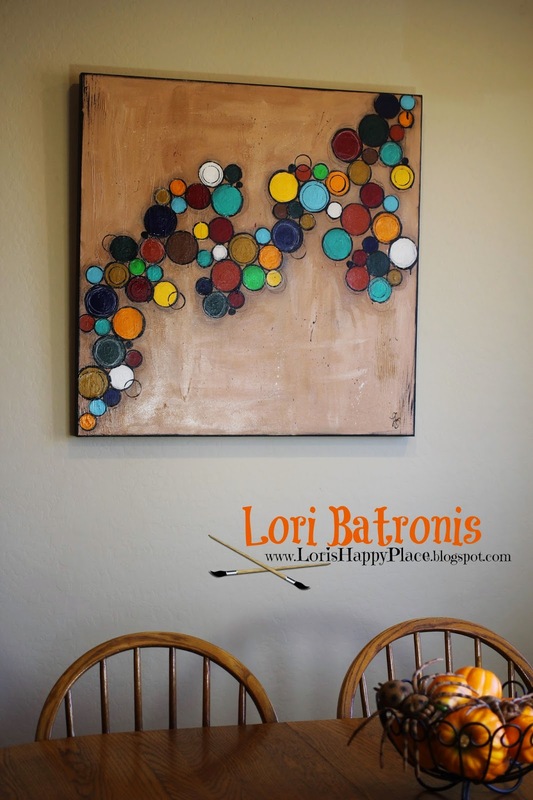 It now hangs in my dining room area, and it makes me smile. Life is good. Life is really really good!!! 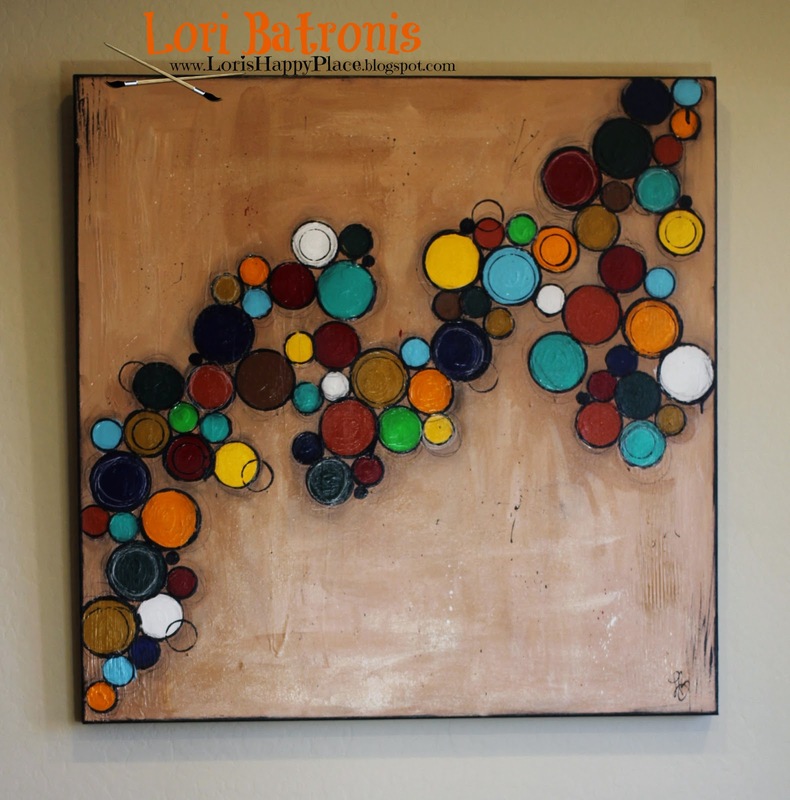 And if you are an artist, when was the last time you hung up your own art? You are amazing. You are worthy. Your art is worthy. Do it!!! The little LB in the corner is new. In the past I always just signed the backs. I have decided that I like it. LB is me, it's time to let the REAL me be seen, and not care if someone likes me or not.